THE FACE SHOP carries nature’s own values, representing natural beauty and vitality. THE FACE SHOP’s products come from nature and delivers values of its roots. Natural ingredients from RICE helps skin from removing dead skin cells to brightening with moisture care. Red(~650 nm) — One of the most powerful colors to increase blood circulation. Stimulate skin cells to excrete collagen to achieve firm and smooth texture. Light Blue (~490 nm) —Soothing, prevent allergy to desensitization, and so on. Step 1: Take a picture before using the mask to compare the results before and after using. Step 2: Wash your face before the treatment. Step 3: Press and hold the “Power Switch” button to switch the LED mask on. Step4: Press “ON/OFF” to start the use. Step 5: Set the time by pressing the “Time” buttons”. To set the mode, press the “Color” button. To Adjust the intensity, press the “Energy” buttons. Made with superior quality MAP Vitamin C, this anti-aging serum is light stable, oxygen stable, and pH balanced for a longer lasting, gentle way to repair the effects of sun damage. It is combined with our hydrating base of pure, vegan, organic Hyaluronic Acid. 1OZ BOTTLE – Also available in 2oz, 4oz, and 8oz sizes. Do you want to look younger? Let’s face it, nowadays, who doesn’t? There is no Anti-Aging Magic Potion that will stop the aging process or clear your wrinkles overnight, but with discipline, a good Anti-Aging Skin Care routine in place, and some help from modern technology, you will be on your way to looking younger for longer. The Au Fait Skin Care Device operates on five core concepts of skin care. These concepts are Galvanic Electrical Tissue Stimulation (ETS), Mesoporation, Electroporation, Radio Frequency (RF) and Light Emitting Diode (LED) photon therapy Light Energy in the following wavelengths, Red:620±5nm;Green: 520±5nm;Blue:465±5nm;Yellow:590±5nm;Pink:700±5nm. Galvanic ETS (Electrical Tissue Stimulation) Intended to activate the skin cell, stimulating rejuvenation of collagen, to improve skin elasticity, soften wrinkles and leave skin looking smooth and healthy. Mesoporation intended to disturb the surface of the skin causing the cells to open temporarily to create tiny moisture channels or mesopores, which provide for the transport of high molecular agents into the skin. Electroporation intended to transport collagen and hyaluronic acid deeper into the skin. Intended to achieve better results with your skin care products without the need for needles or painful skin treatments. Radio Frequency (RF) energy uses the tissue’s natural resistance within the various layers of the skin to transform the RF energy applied to the skin into thermal energy allowing for increased collagen contraction and production of new collagen. Light Emitting Diode (LED) Light Energy works by sending energy-producing packets of light into the deeper layers of the skin. LED treatments can minimize fine lines and wrinkles, bacteria, sun-damage and improve the overall appearance of your skin. BUY NOW to start looking younger and more vibrant! 5 APPLICATIONS in 1 DEVICE! Great for multiple conditions, blemishes, wrinkles, age/dark spots on face or hands and more. FORGET PAINFUL NEEDLE TREATMENTS! Mesoporation gets skin serum up to 6 times deeper into the skin. THIS DEVICE is not intended to medically treat acne or any other skin condition requiring medical treatment. SAVE MONEY! Use less skin care product to minimize wrinkles, age/dark spots, and blemishes. Note: The product may develop dark spots if exposed to moisture, but this does not impact product safety. For best stability, bottles should be stored in a cool, dry, and dark location. Red(650 nm)— One of the most powerful colors to increase blood circulation. Stimulate skin cells to excrete collagen to achieve firm and smooth texture. The red light penetrating 8-10mm is suitable for any type of skin; it can reach derma to stimulate fibre cells. Heating can improve blood circulation and collagen albumen hyperplasia to reduce wrinkles and make skin more elastic and smooth. The mild wave length is suitable for surrounding eyes and forehead. Blue(463 nm)—Excellent effect of kill bacteria, improve sensitive skin The blue light penetrating about 0.5mm has the function of calming against skin rashes; suitable for the skin which is sensitive, oily and with skin rashes. It can adjust skin sebum secretion, effectively get rid of whelk to reach the aim of beautification. Besides, the blue light can astringe and tighten loosened skin. Green(527 nm)—Anti-aging, smooth wrinkle and fine lines, cure wounds The green light between red light and blue light is suitable for mixed skin. It can improve the function of alternating use of cells and oxygen and activate the microcirculation function of body surface. Meanwhile, calming the skin can make both body and skin relax, and reduce the pain of skin. Sunlight Desk Lamp Natural Full Spectrum Sun Light. Simulates Daylight. 150Watt Output uses 27 Watts. Touch On/Off Switch. Best Gift For Youself or Loved Ones. Benefits of full spectrum Lighting: 1) Increases contrast in Reading. 2) Increase release of seratonin a hormone linked to an improved feeling of well being. 3) Increases vitamin D production in skin, which helps the body efficiently use calcium. 4) Render color much more accurately. 5) Reduce levels of melatonin, a harmone that promotes fatigue. About the Bulb: 1) Color Temprature 6500Kelvin. 2) High lumen output of 1800. “Your light is as good as number of Lumens it provides”. 3) Long lamp life of 10,000 hours. 4) Energy usage of 27 watts, light output of 150 watts. 5) 120 Volt AC 50/60Hz. Touch On/Off Switch. If you prefer Rocker On/Off Switch please search the following ASIN B004BABXYM. Certifications CSA, CCSA, FCC ROHS. Stylish and looks great on your desk. Written by Albert Crenshaw 3 Comments Posted in Health Products	Tagged with 150Watt, Daylight., Desk, Full, Lamp, Light, natural, On/Off, Output, Simulates, Spectrum, Sunlight, Switch., Touch, Uses, Watts. Our Organic Fruit + Vegetable Blend is made with organic spinach, kale, blueberries, carrot & more to support a healthy pregnancy, breast health, and healthy estrogen levels. Our Probiotic & Enzyme Blend is made with the good kind of bacteria to enable a healthy metabolism and immune system. When you’re pregnant, every nutrient counts. The IntraNaturals Prenatal Multivitamin contains every beneficial vitamin and mineral needed to support both mom and baby through a healthy pregnancy. We believe that a Prenatal Multivitamin shouldn’t be a bother to your daily routine. That’s why we formulated the IntraNaturals Prenatal Multivitamin to pack as many nutrients and vitamins into one conveniently sized tablet, not three. Take just one tablet at the same time each day, even on an empty stomach. ONE A DAY, EVEN ON AN EMPTY STOMACH – We’ve packed every single nutrient, vitamin, and mineral of our Prenatal into just one tablet (not 3 or 4) that can be taken on an empty stomach with no pain or sickness afterwards. Gone are the days of you taking 4 tablets a day, struggling to keep the first one down in the morning due to stomach sickness! Just one tablet per day provides both you and your baby with all of the incredible nutrients crucial for a healthy & happy pregnancy. COMPLETE NUTRITION FOR MOM & BABY – A Prenatal is an investment into you and your baby’s future together. A great Prenatal means you get the best nutrients possible to ensure your baby is born the healthiest they can be and given the best start in life possible. 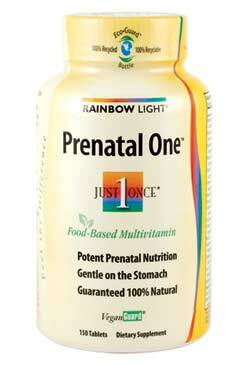 IntraNaturals Prenatal Multivitamin is made with love using all natural, vegetarian, Earth-friendly organic food sources that are non-GMO, soy-free, gluten free, and easy on your stomach to support a healthy pregnancy. ORGANIC FRUIT + VEGGIE BLEND PLUS PROBIOTICS & ENZYMES – Our Organic Fruit + Vegetable Blend is made with organic spinach, kale, blueberries, carrot & more to support you before pregnancy, during, and after, as well as breast health and healthy estrogen levels. Plus, IntraNaturals Prenatal Multivitamin has our Probiotics & Enzymes Blend which is made with the “good kind” of bacteria to enable a healthy metabolism and immune system during pregnancy. 800mcg FOLIC ACID TO SUPPORT VITAL DEVELOPMENT – Folic Acid is one of the most important ingredients in a Prenatal Multivitamin as it is crucial in preventing spinal cord defects in the early development stages of your baby. The USDA (U.S. Department of Agriculture) recommends at least 600mcg of Folic Acid daily for any pregnant or breastfeeding woman. Each tablet of IntraNaturals Prenatal Multivitamin (one serving) contains 800mcg of Folic Acid which more than meets the recommended amount. PROTECTED BY THE INTRANATURALS LIFETIME GUARANTEE – All IntraNaturals products come with our Lifetime Guarantee. If at any point in the future you’re not happy with your order, let our friendly Customer Care Team know and we’ll refund your entire purchase – 100% Guaranteed. SUPERIOR INGREDIENTS INCLUDE: Organic Rosehip Oil, Organic Sea Buckthorn Oil, Green Tea Extract, Botanical Hyaluronic Acid, and Resistem (Plant Stem Cells). All ingredients chosen for their anti-aging properties and ability to enhance Vitamin C efficiacy on your face and skin. This best-selling natural FOOD-BASED multivitamin provides targeted support for women for a difference you can feel. Contains bonebuilding nutrients an energizing B-complex for stress management and heart health, iron and other research-backed nutrients and potencies. Now guaranteed AllergenSafeguard (free of gluten, soy, yeast, fish/shellfish, nuts, dairy) and with 90 million bioactive probiotics. Also free of artificial colors, flavors, sugar, sweeteners, preservatives, and other objectionable additives often found in vitamin products. 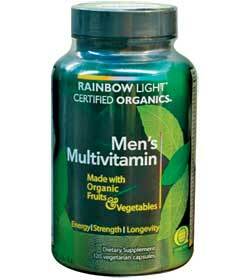 Rainbow Light Women’s One Multivitamin is a top-selling natural women’s multivitamin. A 100 percent natural, food-based supplement, Women’s One delivers essential nutrients to support breast and bone health and boost energy levels in just one tablet per day. Formulated to deliver pure and potent nutritional protection, Women’s One Multivitamin is rich in essential vitamins, minerals, superfoods, and herbs, as well as probiotics to ease digestion. It contains no artificial colors, flavors, sweeteners, preservatives, or additives. It’s also entirely free of sugar, lactose and dairy, wheat, gluten, and yeast, and is gentle on the stomach. Rainbow Light Women’s One Multivitamin provides a nutritional boost and supports long-term health and vitality with just one tablet a day. Each tablet contains key ingredients that support heart, breast, and bone health, aid stress management, and help increase overall energy. One tablet has 800 IU (200 percent DV) of vitamin D3 for bone and breast health, 6 milligrams (33 percent DV) of iron for healthy red blood cells, and 25 micrograms (417 percent DV) of vitamin B12 for energy and nerve cell protection. This formula combines herbs and food-based nutrients that address women’s specific nutritional needs. A total of 125 milligrams of women’s nourishing blend, including dong quai, organic spirulina, and red clover, support hormonal balance. A vegetable juice complex equivalent to 40 milligrams of vegetable powder delivers the benefits of nutrient-dense green foods such as kale, spinach, and beet for nutrition and energy, and to aid absorption of other key co-nutrients. Women’s One Multivitamin supports an active lifestyle. A complete B-complex (including B1, B5, B6, and B12) energizes, balances, and protects the systems of the body. A full 800 micrograms of folic acid and 800 IU of vitamin D3 support a healthy cardiovascular system. Unlike other multivitamins that can be difficult for the body to digest, resulting in stomach upset, Women’s One Multivitamin is specially formulated to be gentle on the stomach and digestive system. Superfoods like kale, spinach, beet, and organic spirulina aid the digestion of critical nutrients. Gentle plant-based enzymes and 25 million CFU probiotics support the body’s natural digestive balance and may boost overall immune system health. Women’s One is guaranteed to be 100 percent natural and free of artificial colors, flavors, sweeteners, preservatives, and additives. It’s also entirely free of sugar, lactose and dairy, wheat, gluten, and yeast, and is gentle on the stomach. Women’s One Multivitamin can be taken with or between meals. Women’s One is packaged in 100 percent recycled, 100 percent recyclable, BPA-free EcoGuard packaging, which has a 92 percent lower carbon footprint than virgin plastic. 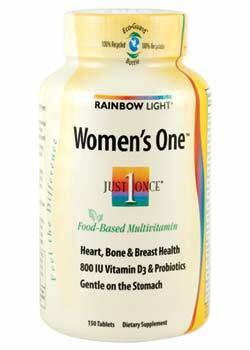 Rainbow Light Women’s One Multivitamin (150 Tablets). Supports healthy digestion, absorption and regularity with 25 million CFO probiotics, gentle, and plant-sourced enzymes. The first and only multivitamin to deliver science-based nutrient potencies in a certified organic multivitamin, rich with organic super fruits, vegetables and targeted herbs with comprehensive whoe body energy and liver support. Reach a stronger state of health with Rainbow Light Certified Organics Women’s Multivitamin (120 Vegetarian Capsules), a supplement rich in customized botanical blends to renew, strengthen, and protect core body systems for lasting performance, vitality, and health. The comprehensive, food-based formula contains optimal, research-based nutrient potencies of nourishing certified organic whole foods, such as spirulina, acai berry, pomegranate extract, beet, and kale. The easy-to-swallow vegetarian capsules also provide organic adaptogenic herbs, including American ginseng, angelica, and green tea, that fortify and protect the female system and promote energy. Safe for those with common food allergies, Women’s Organic Multivitamin is guaranteed to be free of gluten, soy, dairy, yeast, fish and shellfish, and nuts. This formula, which is certified organic by QAI (Quality Assurance International), is also free of sugar, lactose, artificial colors, flavors, sweeteners, preservatives, and other objectionable additives often found in vitamin products. Rainbow Light Certified Organics Women’s Multivitamin delivers science-based nutrient potencies in a certified organic formula that’s rich in organic super-fruits, vegetables, and targeted herbs. It’s produced in Rainbow Light’s certified organic facility with rigorous quality standards for superior purity. Women’s Organic Multivitamin is certified organic by QAI (Quality Assurance International). Four capsules daily of Women’s Organic Multivitamin provide 1,000 IU of vitamin D3, 800 micrograms of folic acid, and 25 million CFU probiotics to support immunity, heart, and bone health. Diindolylmethane (DIM) aids in the metabolizing of estrogen. This formula cleanses toxins, re-balances estrogen levels, and strengthens digestion with liver-protecting botanicals, including 124 milligrams of organic milk thistle, organic artichoke, and organic ginger. Additionally, 694 milligrams of gentle digestive support, including protease and lipase, help maintain digestive health. 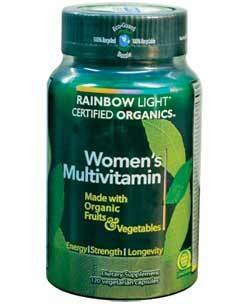 Women’s Organic Multivitamin can be taken with or between meals. You can also sprinkle it on food or add it to smoothies and drinks. Women’s Organic Multivitamin is packaged in 100 percent recycled, 100 percent recyclable, BPA-free EcoGuard packaging, which has a 92 percent lower carbon footprint than virgin plastic. Rainbow Light Certified Organics Women’s Multivitamin (120 Vegetarian Capsules). Organic digestive and liver support helpts to cleanse toxins, remove excess estrogen and strengthen digestion with liver protective botanicals.